Range Rover LRX will be built in UK | What Car? Land Rover today announced its decision to build a production model of its LRX concept car at the company's Halewood factory in Merseyside. Production of the vehicle will create up to 800 new jobs at the Halewood plant. The news follows speculation that the company's owner, Tata, would transfer production to India. Up to 300 jobs were lost at Halewood when the Jaguar X-type ceased production this year 12 months earlier than planned. 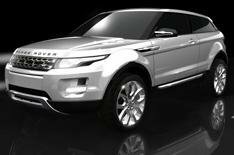 The new model will be badged Range Rover and will go on sale in 2011. The LRX is expected to be one of the greenest SUVs on the market and will also be Land Rover's smallest and most efficient vehicle. Land Rover says it's aiming for CO2 emissions of less than 150g/km for all models, but a hybrid version that will achieve more than 60mpg and emit less than 120g/km of CO2 is also being developed.